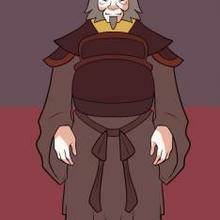 This is going to be easy to draw. 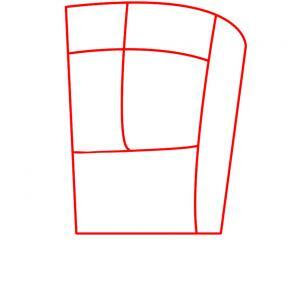 Start by drawing a square, and then draw a two dimensional line along the side. Now add the big plus sign for the facial guidelines. 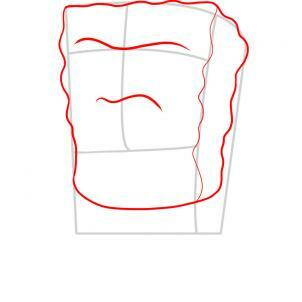 Using the guidelines you drew that formed a shape in step one, you will draw out the squiggly outline of Spongebob's body like so. Once that is done draw the one unibrow line which is a bit wavy, and then the top lip line. Now draw the large circles for the mean looking no nonsense eyes, and then draw in the pupils, nose, and two front square teeth. Don't forget to draw the indent line that the teeth are resting on. Next, draw the arms like so. 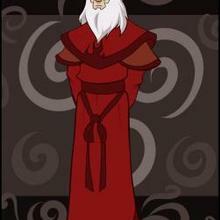 Finish drawing his arms which are crossed over one another, and then draw out the outline of his baggy pants like so. 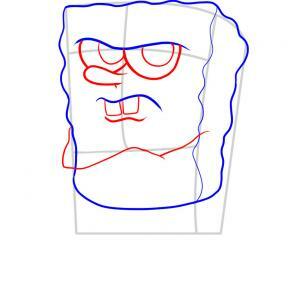 Once that is done you can draw the rest of his eye shapes which is his half closed lids, and then draw the bandanna. Add some freckles, and cheek humps under the eyes. 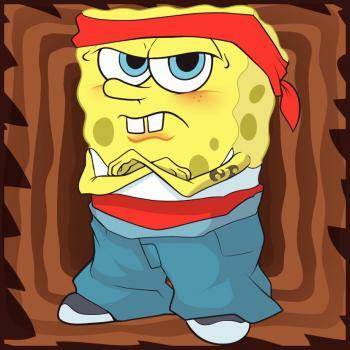 As you can see gangster Spongebob is looking more and more ruthless the further you go. All you have to do here is add the detailing to his jeans so they look baggy, draw out the sneakers, color in some holes as well as his pupils, and then draw the rest of his hand and make the tattoo design on the arm. 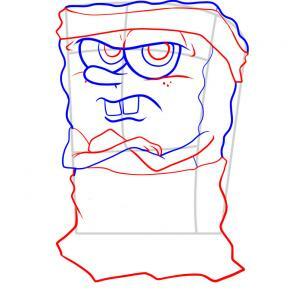 Erase the lines and shapes that you drew in step one to clean up the drawing. 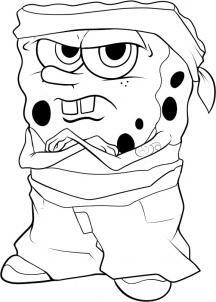 Here is what your new gangster version of Spongebob looks like when you are all done. Now you can color him and to finish him off. 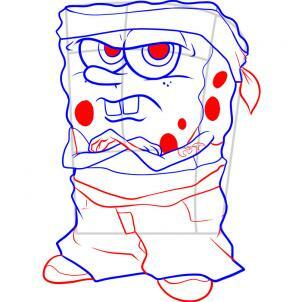 Thanks for joining me with this tutorial on how to draw Gangster Spongebob, step by step.